Johnny Depp certainly has a knack for playing oddballs roles. 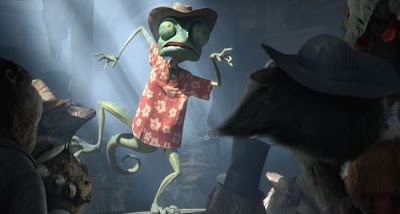 He's made quite a stellar career out of it, so I find it completely fitting he voices one in his latest film - Rango. Once again Depp and director Gore Verbinski team up in this charming, animated western about a chameleon who get's scattered to the wind only to be blown into a two-bit, all-animal town that is dwindling due to a water shortage. Folks in the town of Dirt accept their miserable fate, but Rango, a wannabe actor who views the situation as a chance to go deep into "character," somehow convinces the towns creatures he's going to turn things upside down by making things right once again. He puts together a team of volunteers to hopefully save the day/town. 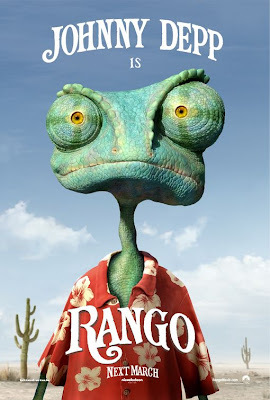 Rango is off its rocker. It's fun and silly, but it's smart-silly, with its nod to Western icons and its sneaky references to a waterless future. It's beautiful two-dimensional animation springs to life with more energy a nd kick than most of the lame 3-D movies do these days. I loved the rich colors and dizzyingly, quirky characters. Great cast! And of course Depp is Depp - a master of self-awareness and self-mocking. Love it! I did think it was a tad bit long, though, but all in all, I fully enjoyed this animated feature and even though a lot of critics are saying it's not for little kids, I would have to disagree. I think kids would love it just as much as adults.